Finally, the warmer weather and sunny days have arrived. That means it’s time for everybody’s favorite time of the year-spring cleaning! Can you sense the sarcasm here? Don’t get me wrong, I love it when my house is clean, and I’m not adverse to getting my hands dirty, but spring cleaning usually means there’s a lot of hard work to do. All winter long I’ve been in maintenance mode, keeping things clean on the surface while anticipating the annual spring clean sprint. It’s the time of year we can really do a deep clean of those forgotten and neglected areas of our homes-which can be time consuming and exhausting. So why not break it down into a more relaxed and less daunting schedule? I’m going to tackle different areas of my home that need a good scrubbing, over the course of 7 days. Ok I admit it, this is my least favourite room to clean (and it’s probably yours too). So why not get this one out of the way first and be done with it? Now I do a standard cleaning of the bathrooms about once a week, so let’s forget about the obvious gross area (the toilet) and look for what hasn’t been done in awhile. Take apart and clean the exhaust fan. Scrub the bathtub-while standing up. We spend much of our time in the kitchen preparing and enjoying meals together. While the surfaces are wiped down daily, it still could use a little TLC to really make the room sparkle. Scrub dirt and grime off your cabinet doors. Purge and Deep Clean your fridge. Clean the drain (do this in the bathrooms too). Make your rooms brighter and let the sunlight in by cleaning all the dirt off the windows. Get the gunk out of the tracks. Get a streak free shine. Now that the light is spilling into your home through clean windows, you might notice a little (or a lot) of dust, dirt and pet hair on your floors. Clean the baseboards and keep them clean (with dryer sheets!). Get rid of dust and dirt build up in the vents. 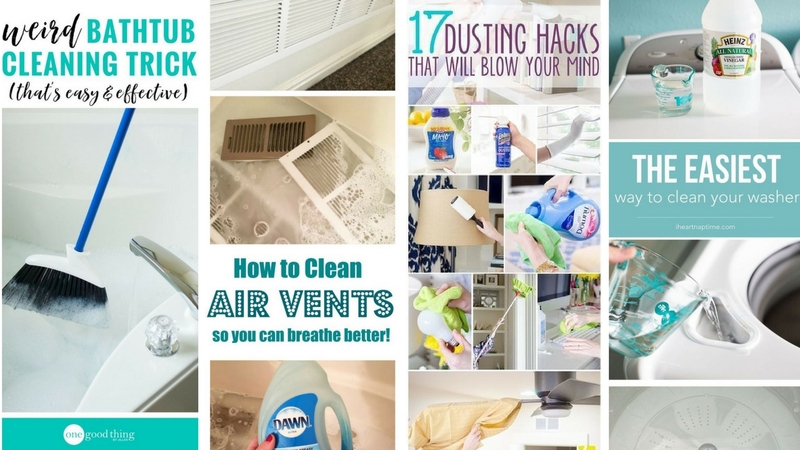 Dust every surface with these neat hacks. Clean your washer for cleaner clothes. Prevent fires by cleaning the dryer vent. Get outside and enjoy the spring weather-and make your house look good while you’re out there. Give your car some love. Tell me, what areas of your home need the most attention come spring? For more spring cleaning inspiration, head to my YouTube channel and check out my recent video on Spring Cleaning!